microVISC™ and m-VROC™ are both small sample viscometers capable of improving your viscosity measurements for injectability. 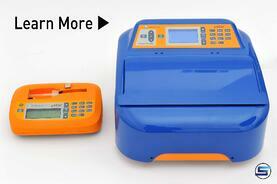 To learn more, click on the corresponding images! When sustainable release and subcutaneous injection are achieved, the concentration of protein inevitably increases, causing an increase in viscosity. The increase in viscosity creates significant challenges in Injectability, since high viscosity requires high injection force. This, in turn, affects how an auto-injection system needs to be designed to achieve optimum performance. A drug injected through a small needle (e.g. 27 gauge needle), with a rate for the injection time of 10 seconds, will have a shear rate inside of the needle which is estimated to be 160,000 s-1. It is important to note that at this specific shear rate, the viscosity of the drug can be significantly different from which it would be at a lower shear rate. 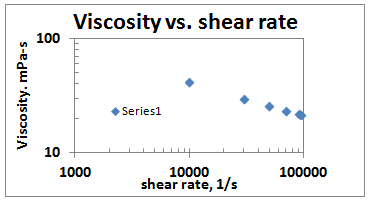 The viscosity of a model drug at a shear rate of 100,000 1/s is half of the viscosity at a shear rate of 10,000 1/s as shown in the graph. Therefore, in order to estimate accurate injection force, the viscosity should be measured at the shear rate inside of the needle. 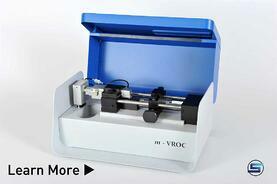 Accurate viscosity measurements and accurate injection force can be estimated with m-VROC™ viscometer since viscosity values at shear rates of up to 90,000~200,000 s-1 , taking place inside of the needle, can be measured with high accuracy. m-VROC™ allows viscosity measurements up to 200,000 s-1 and eliminates the guesswork out of injectability studies in early stage formulation development by allowing direct and accurate estimation of the injection force. The table below shows how the injection force, estimated with the measured viscosities at the shear rate inside of the needle, corroborates well with the accumulated data. The difference between the estimated injection force and the reported injection force is typically due to the gliding force of the piston against the barrel, which fluctuates from syringe to syringe and from one model to another.